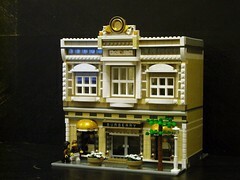 Brick Town Talk: Burberry - LEGO Town, Architecture, Building Tips, Inspiration Ideas, and more! A terrific building by Flickr member Jared Chan features another clothing outlet in his long line of clothing outlets. As always, his details are top notch and offer that "solid" look so well known with the Cafe Corner line of sets from LEGO. Keep up the great buildings!